Newly released documents show that the U.S. government drew up a plan in April of 1956 for how to deal with an impending nuclear war. What was its strategy? Declaration of martial law, evacuation of top American personnel to secret offices, and the immediate detention of over 12,000 people with ties to "subversive organizations." It was called Plan C.
Muckrock has obtained these new Cold War-era documents detailing the doomsday scenario through Freedom of Information Act requests sent to the FBI. Plan C evolved and changed as different people in the chain of command got involved. At one point, Plan C was envisioned as a measure that would be implemented before any potential war might start. In other iterations, it was to be the course of action only after nuclear war with the Soviets had begun. On November 22, 1955 the Soviet Union first successfully detonated a hydrogen bomb, finally catching up to the United States with its nuclear tech capabilities. 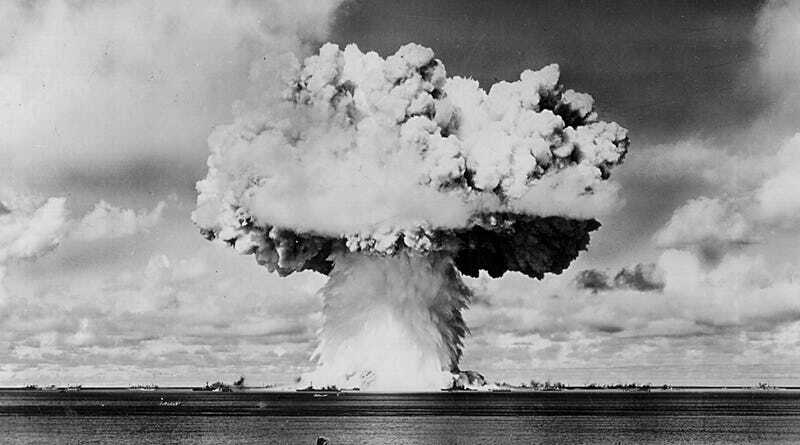 The H-Bomb was roughly 1,000 times more powerful than the atomic bombs that had been dropped on Japan a decade earlier, and more than ever, the U.S. was concerned about the prospect of worldwide nuclear annihilation. By April of 1956 it had drafted its new emergency response. One aspect of Plan C was the implementation of an emergency program to arrest precisely 12,949 individuals whose "affiliations with subversive organizations" made them a threat to the security of the United States. "Enemy diplomats" were to be arrested as well. The newly released documents don't include who precisely was on these lists. Was there a Plan D? You bet. Plan D involved the relocation of all high ranking government personnel to secret locations. It was part of "Operation Alert, 1956," which was tested in July of 1956. Details of the CIA's plan for Operation Alert 1956 were released in 2009. We're no longer embroiled in the middle of a Cold War. Or at least we're not supposed to be. But you can bet that the U.S. government has all kinds of contingency plans in place in the event of nuclear war or the like. Do those plans include martial law and the rounding up of people considered subversive? I suppose we'll find out in another 60 years. Provided we're lucky enough to avoid nuclear war in the first place.